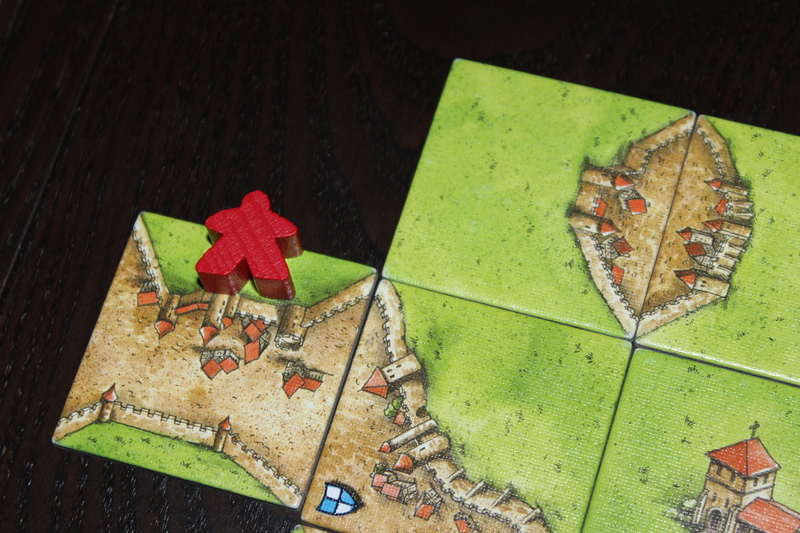 #16 – Carcassonne [Base Game] – What's Eric Playing? September 20, 2015 April 30, 2016 • What's Eric Playing? This is actually the Big Box, which is the base game + more expansions. Base price: $35 (though I’d recommend the Big Box for $75). Alright, we’re finally getting into this. So this isn’t quite base Carcassonne, this is actually the base game + 5 expansions, each of which I will probably review separately (except for the River, but I may still talk about it in a later post). 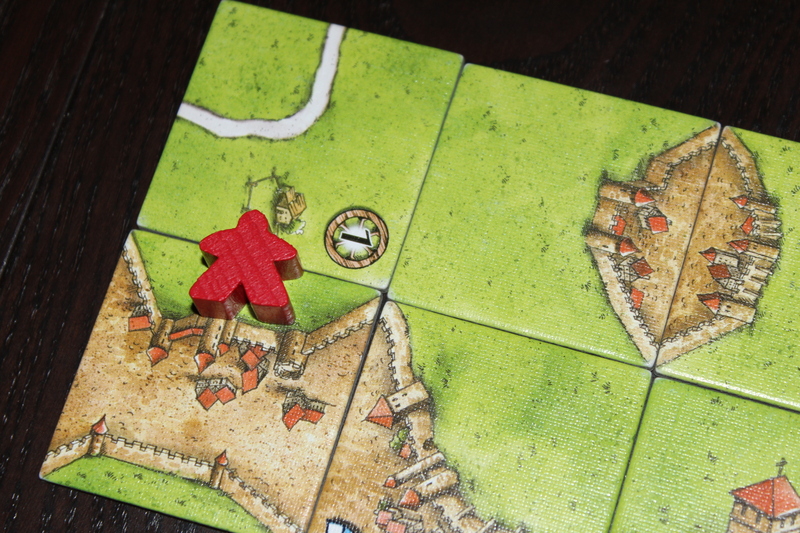 In Carcassonne, you are … medieval city planners? Lords and ladies of the realm? God? I’m actually not 100% sure on this one. Should have read up on the lore. Regardless, it’s a mix of a tile-placement and area control games, both of which I will explain later. Let’s instead focus on setup. 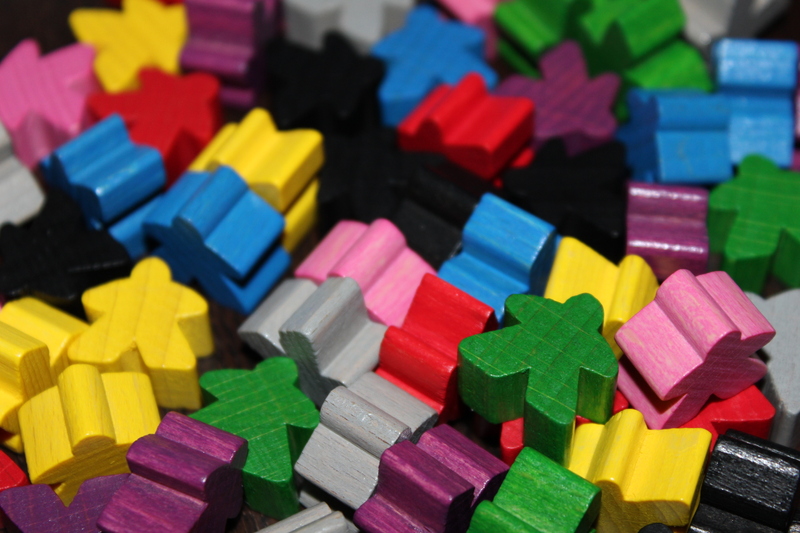 These are called meeples, colloquially (“my people”), and each person gets 8 in their color of choice. However, they must sacrifice one of them to the vengeful gods of scoring points, so place one of each players’ meeples on the scoreboard on the 0. This is all very straightforward, but on the plus side, you’re ready to start! Let’s talk gameplay. 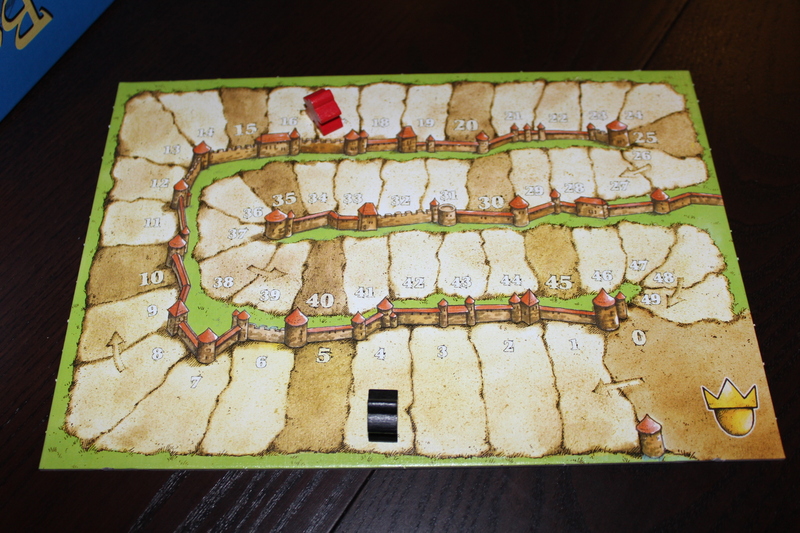 So, Carcassonne is a fairly simple game to understand, it’s the scoring that’s a bit complex. So I’ll give examples of how things are done. 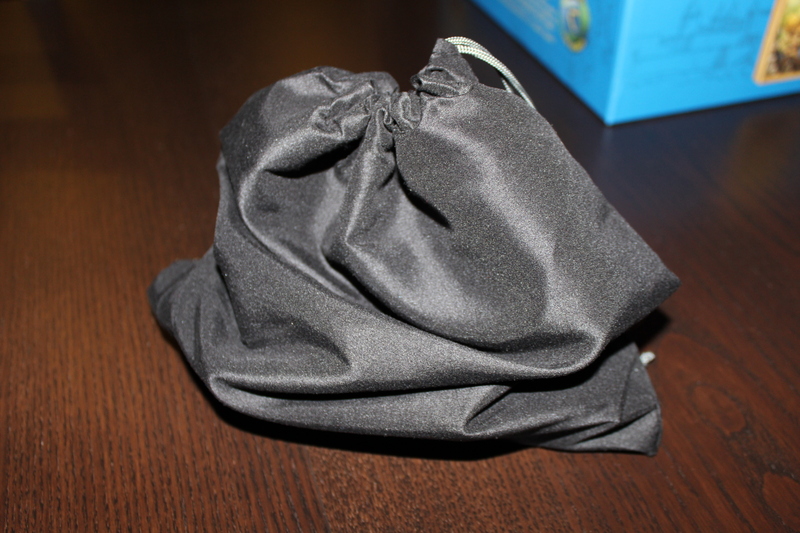 First, you draw a tile from the tile bag, and then you can, if you would like, place one of your meeples somewhere on the tile provided it’s not already controlled. Then, if that featuer is completed, you score that feature. Let’s parse that sentence out a bit more in parts — drawing tiles, placing meeples and scoring, and the nebulous concept of control. See how cities connect to cities and fields connect to fields and roads connect to roads? Good. Note, you must place a tile where it is possible to do so. Sometimes that means you have to place a tile somewhere you don’t like. Tough. 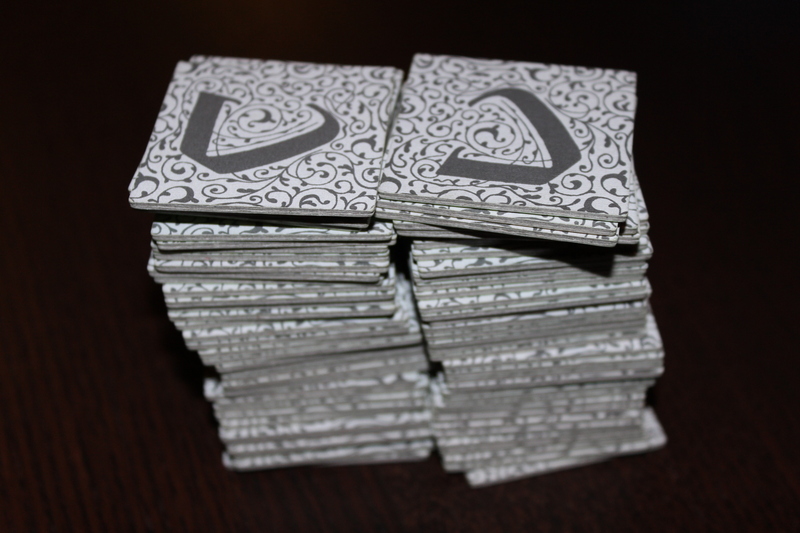 If you cannot validly place a tile, discard it and draw a new one. 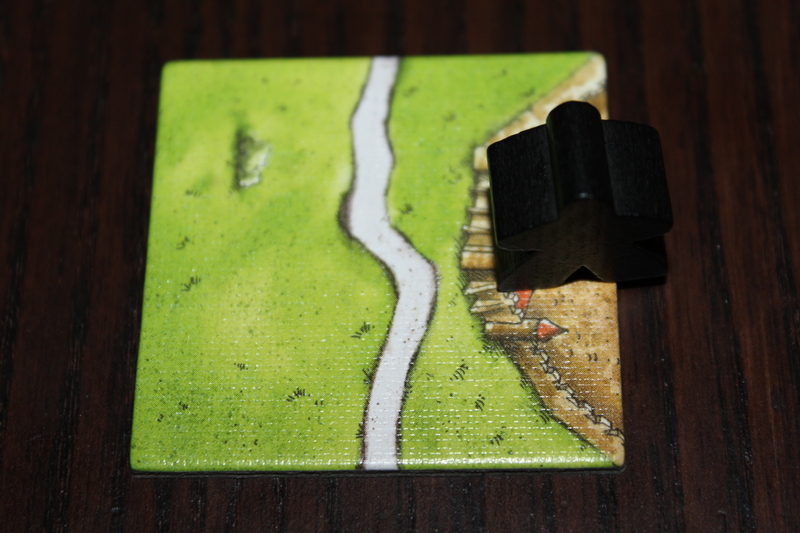 Now, you’ll notice that there are meeples placed on these roads. Why? If you place a meeple on a road (the white part), they become a thief, dedicated to a surprisingly-mediocre life of crime. Should you complete a road, you score 1 point per tile in that road. This means if you manage to have a road loop back through a tile twice, that tile only counts for one point (difficult but possible). However, if you do not complete the road before the end of the game, it is incomplete and you are sad. Incomplete roads are still worth 1 point per tile in that road, though, so you’ll probably get over it. What does a complete road look like? Note that Black and Red each have one meeple on that road, so they each score 9 points (the road ends on the tile that Red’s meeple is on at that tiny town). 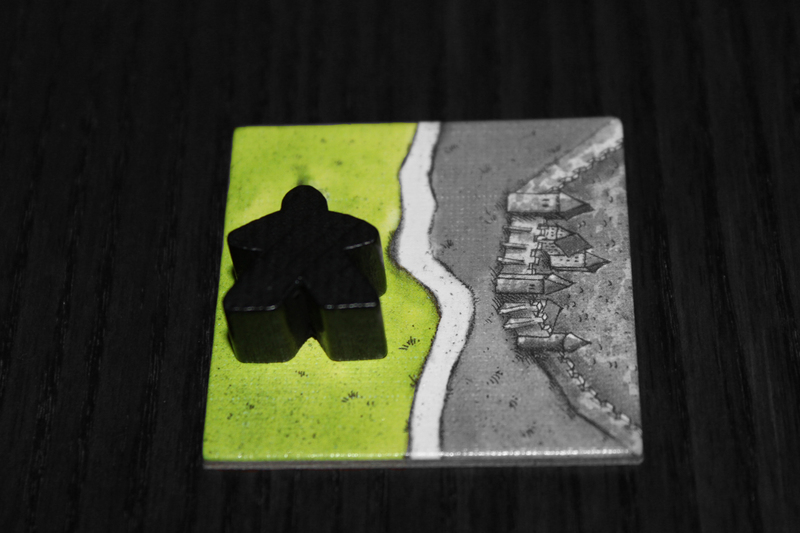 If you place a meeple on the city (the brown part), they become a knight, dedicated to protecting their city and literally nothing else. It’s that blue-banner-looking thing. If you happen to have at tile with a pennant on it, you score both the tile and each pennant (some expansions have more than one!). Pennants are pretty great, since they’re an extra 2 points each in a complete city and 1 in an incomplete city. A city is considered complete when the outer wall is done and the inside is filled in correctly (note how the above tile needs at least two ending pieces to be finished). Monks can only be played on special monastery tiles, in which they devote themselves wholly to Carcassonne God (who may or may not be you? Like I said, really unclear on the lore). 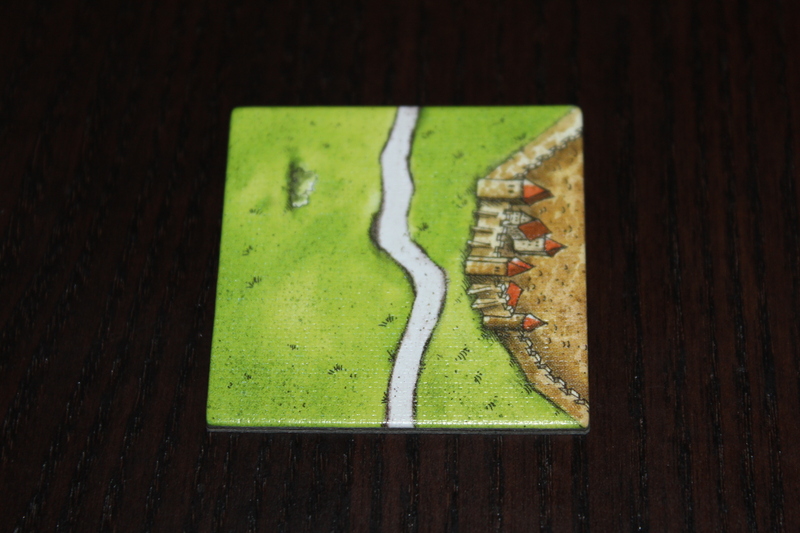 Note that on this tile there’s also a road and a farm that can be placed in, rather than the monastery. Monasteries only score when there are 8 correctly-placed tiles surrounding them. This can be a bit complicated. While they are exceedingly difficult to complete, if you finish one, they are worth 9 points. Nice! If you can’t get it done, an incomplete monastery is worth one point for every tile in its perimeter, not including itself. Bit of a bummer, but still free points. The farmer is one of the hardest ones. When placing a farmer, he falls asleep in a field and waits until the game is over. Yes, this means you will not get your farmer back for the entire game. 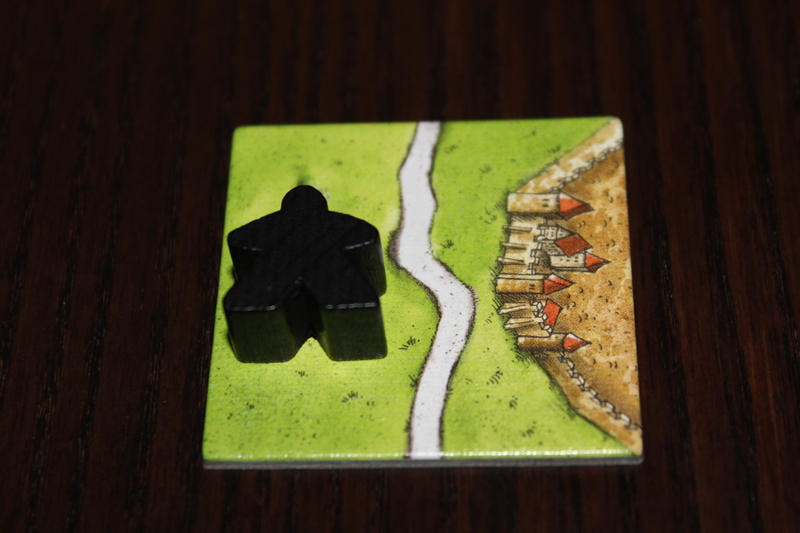 The other green part is its own unique farm, and black could have placed his meeple there instead. Now, why would you want to basically lose a meeple for an entire game? Well, farmers score three points per completed city touching their field once the game ends. And, as you imagine, fields grow pretty quickly. I’ve seen games where someone will score 50+ points with one massive farm. However, farmers earn no points for incomplete cities in their fields. Just something to think about. She’s allowed to place that tile, and suddenly her farm is connected to Black’s farm! You can also do this with cities and roads, though it’s pretty difficult to do with roads. This can also really turn the game around. Now, keep drawing and playing tiles until you run out. 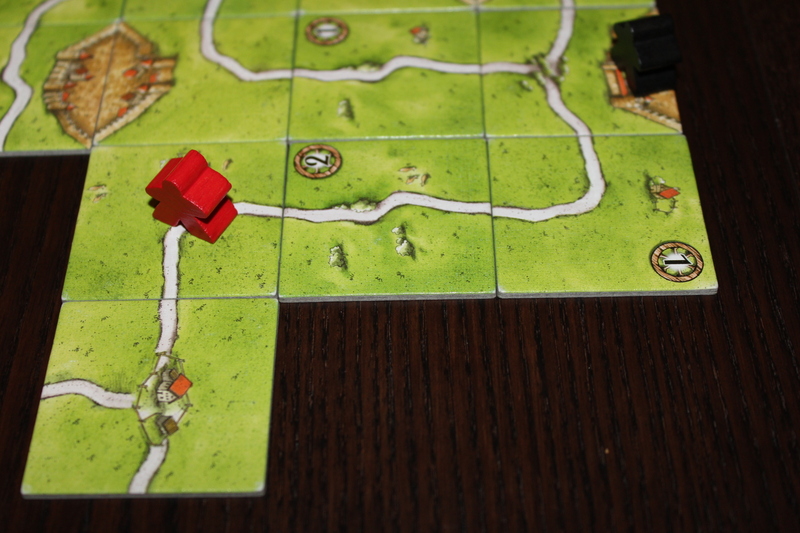 Then score the farms and incomplete tiles and whoever has the most points, wins! Note: There is a specific order to your turn, and this is important. Score any completed features and return those meeples to their players. 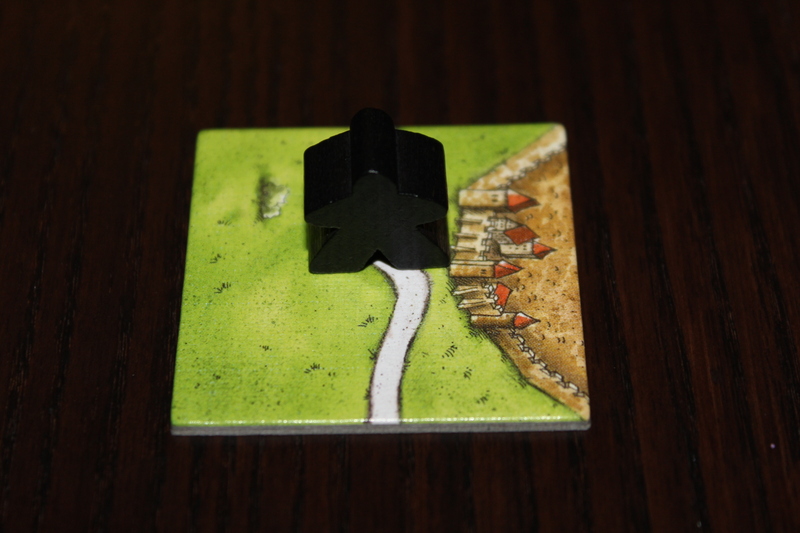 This means that if you are out of meeples, you cannot place on the tile you just drew, even if you complete a feature that turn and get a meeple back. This is because placement happens BEFORE scoring. Anyways, let’s get some strategy in here. You’d think this is a fairly random game since you’re randomly drawing tiles, but there are a lot of ways to think about how to maximize your score. If you control the farm, try to make it bigger. If you don’t, try to steal control or cut it off. Using roads and cities to split a farm is often the only way to stop a rampage, but you can temper it a bit if you either steal control of it or never let it get too big in the first place. This is much easier said than done. Targeting other players isn’t a good idea in larger games. Think about it this way. In a two-player game, if black prevents red from scoring but black doesn’t score, black stays ahead. In a five-player game, black prevents red from scoring but black doesn’t score; purple, yellow, and blue each score on their turns. Suddenly black went from first to fourth, even though red is still below them, score-wise. It’s better, in my opinion, to focus on scoring big rather than focusing on targeting other players if you aren’t playing a small game. Note that some expansions (such as The Princess & The Dragon, with its meeple-eating mechanics) can change this up somewhat. It can be useful to drop farmers towards the end of the game. You’re not getting meeples back anyways, and you don’t want to finish the game with 7 meeples unplaced (unless you were just finishing up all your features). Might as well try to find unoccupied fields and go for it, if it’s worth enough points. Keep track of how many tiles are left. It’s totally fine to ask how many tiles are left and plan accordingly. You don’t want to start constructing your masterwork giant Carcassonne Metropolis with only 3 tiles left in the bag. While you may not be able to get an exact answer, you’ll usually get a ballpark of “a bunch” or “not many”. This is one of the cons of having a tile bag — you can’t see the tiles so you can’t figure out how many are left. However, it’s fine to have an endgame strategy, and I’d actually recommend one. Your last turns should be as optimal as possible. You can basically reason out how many points your last few tiles will get you. It’s okay to take a bit more time trying to find an ideal spot, but don’t agonize over 1 or 2 extra points. It’s a tiny bit inconsiderate to other players. That being said, a monastery drawn on the last turn might be a better for a farmer than a monk, for instance. It can be a tough game to grasp, but a lot of it is trying to play optimally with a very limited selection of options. Accessible to many different playstyles. 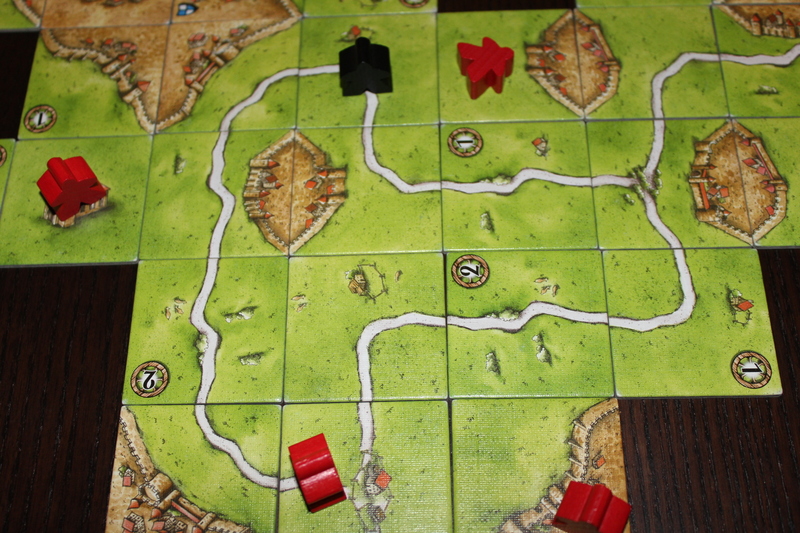 Whether you want to be a road warrior or a city person or farmlord, you can pretty much play however you’d like in Carcassonne. It also supports both aggressive and noncombative playstyles, so it has a pretty wide appeal. There are many paths to victory, and not all of them involve fighting over farms or stealing cities from other players. Simple concept with potential complex gameplay. The setup is not complex and the gameplay is straightfoward (draw tile; place tile; place meeple; score feature), but it has some really nice interaction that can make it complex and deep (“Is it worth playing this tile and completing both my city and her monastery?”). Many, many expansions that add depth and complexity. It has at least 10 expansions (and several mini-expansions). While you’ll have trouble finding them all (see below), most of them are worth it. Not all of them, but most of them. Tile placement games are great. As usual, like Betrayal at House on the Hill, Lanterns: The Harvest Festival, or even Tsuro: The Game of the Path, games with an element of tile placement give me a real sense of accomplishment after I’ve finished and I can see the thing we just spent time building. It’s probably one of my favorite parts about these kinds of games. I don’t like the new art. There, I said it. I like the old art (the one I have), but they’re clearly planning to remake all the expansions with the new art style. It’s making it near-impossible to get all of the old expansions, so I will eventually have to have mismatched game art and it makes me sad. The scoreboard irritates me a bit. This is a nitpick, but the score spaces aren’t uniform so games can seem a lot closer or a lot further apart than they actually are. This can occasionally influence my playstyle (not usually, but it does make me wonder if I should be trying to steal Red’s city or Green’s city). Just an odd design choice made on that one. Most other scorekeeping games have a scoreboard where everything’s the same size. Also, it occasionally makes you feel bad at math because you move a piece varying distances even if you consistently score say, 8 points per turn. Shuffling tiles is the worst. Seriously, just get a tile bag. You won’t regret it, especially if you start getting expansions. Very, very vanilla. The base game is extremely plain, and while it plays fast it doesn’t have a lot going for it. Most versions of it do include The River, a mini-expansion that adds in 12 starting tiles with a river that flows through them. It makes a much more interesting start (since it’s semi-randomized and you have to complete The River before placing any other pieces), which is very nice. A bit pricey for a vanilla game. I would not pay $35 for the basic Carcassonne. 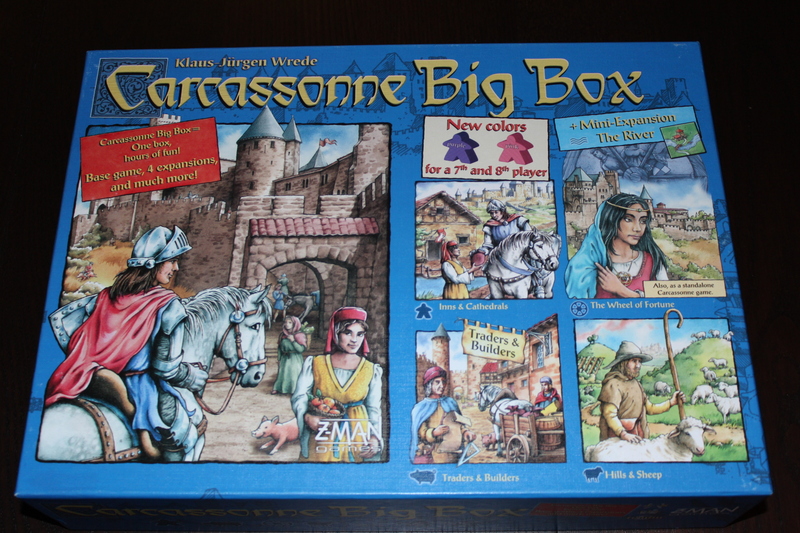 I’d rather just try to get Castles of Mad King Ludwig on sale for $40/45 or grab the Carcassonne Big Box 5 on sale for $50/55. It’s got a Catan vibe in that way, also with its literally preposterous number of expansions (>10). However, the expansions are not very expensive (usually <$20 if you can find them on ebay or Amazon). Scoring is a bit confusing to new players. Not a lot of people “get” farmers straight away, so they tend not to use them in their first games. This is usually a pretty problematic strategy (or lack thereof), and it costs them. Knights and Thieves are pretty straightforward, but Monks are slightly confusing and Farmers are fairly opaque to some new players. Let me be clear — this is a fairly biased score.Here’s why. I will almost never play only vanilla Carcassonne anymore. There are other games that do much more interesting tile-placement mechanics with no expansions (Castles of Mad King Ludwig, Suburbia). However, the expansions are better than good — they’re fantastic. They add so many new elements, new meeples, new tiles, and new strategies that it’s impossible to play the same game twice with them, especially when you start mixing and matching. It’s a fantastically modular game like that. 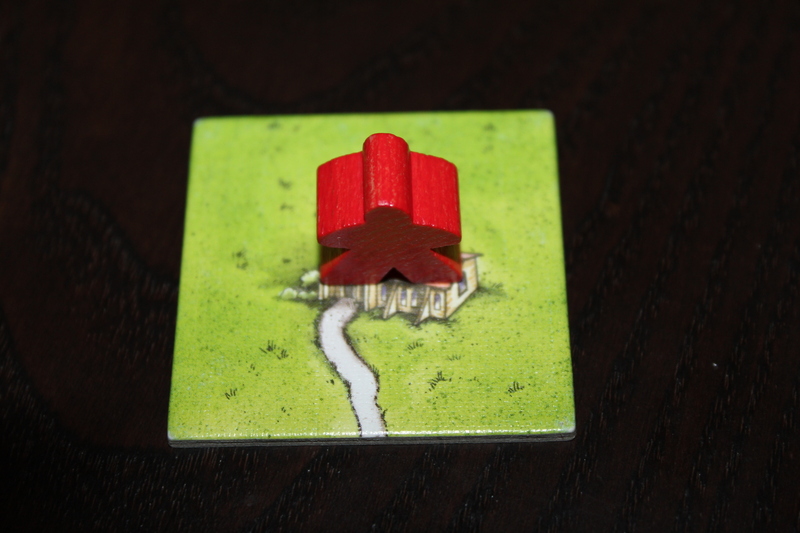 In fact, I actually consider Carcassonne: Inns and Cathedrals (expansion 1) to be part of the base game, for all intents and purposes (except for this review; I’ll write it up later) — that’s usually how I teach new people and it adds very useful (and needed) mechanics to make the game more interesting and slightly more aggressive. It’s a fun game, don’t get me wrong, but the base game is just simply not the best tile-placement game in town. It’s got a lot in common with Lost Legacy / Love Letter, in the sense that the first set is a good preview of how much fun you can have if you get the subsequent sets. And like Lost Legacy, much of its fun comes from mixing up the various expansions and seeing what happens and what you can build. Traders and Builders is also a great expansion, if you’re looking for an additional one. 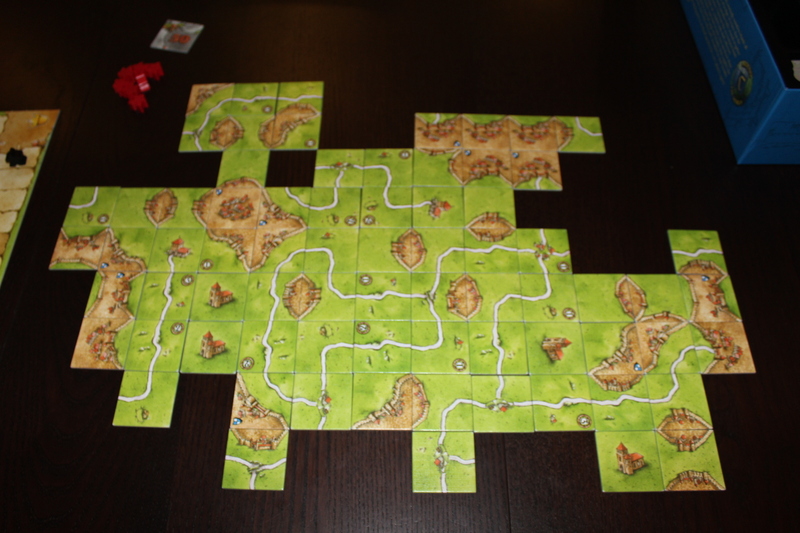 I will say that I prefer Carcassonne in smaller player groups. With two players it becomes almost chess-like, trying to figure out how to block their attempts to thwart you three moves ahead and setting up farms or combining cities to try and beat them to the punch. With more than four, it starts taking too long to get back to your turn and you get a bit lost in the crowd. Just my two cents. 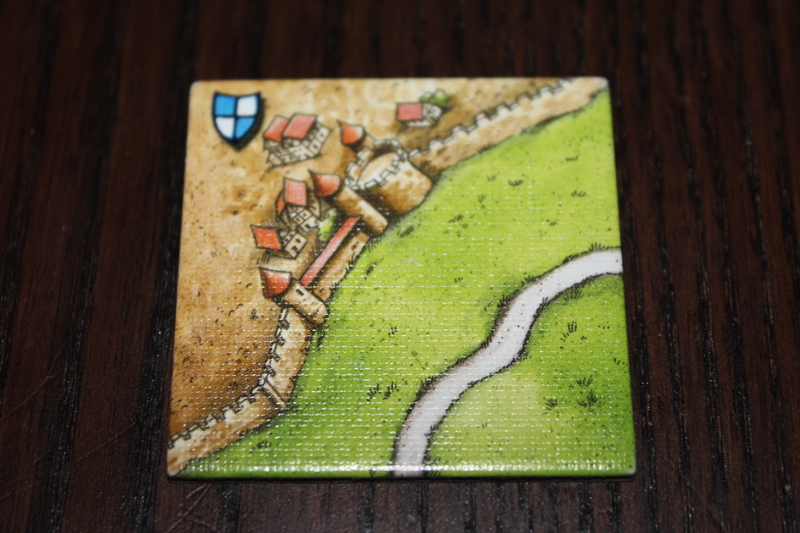 Posted in reviewTagged board game, board games, carcassonne, competitive, competitive game, tabletop, tile game, tile games, zman gamesBookmark the permalink.